Well , Good old Joe, is getting off to a good start. The 66-year-old has spent the last two days confirming he is back at the club as director of football, heading back to St James' Park after a short but controversial spell as manager in the 2008-09 season. Newcastle have yet to officially announce the news but their fans have been quick to voice their dissent, with one fanzine editor saying it made his club a laughing stock. Kinnear's first time on Tyneside was overshadowed by a foul-mouthed rant at journalists, accusing them of having an agenda against him and, while he returned to his grudge against the media on Monday night, he hit out at the fans as well. When asked by talkSPORT what he would say to unhappy fans, he said: "To all the fans who don't agree with this decision, shall I bring (Derek) Llambias (managing director) back in?. What do you want? What do they want? "I heard a silly comment of 'what can I attract?' I can open the door to any manager in the world, anyone, that's the difference. I've spent my whole life talking to Alex Ferguson, week in, week out, what would you do? "I don't know what angle they've got, if they want to sit down and argue with me... Some are talking out of their backsides, a load of tosh. I'm not accepting it, as simple as that. I have certainly got more intelligence than them, that's a fact." Kinnear's initial announcement caused surprise in the game, giving how his initial spell with Newcastle panned out. While his time in the dugout was ended by a heart attack, results on the field contributed to the club's relegation from the Premier League. United's fans have reacted accordingly but Kinnear, who struggled with some Newcastle players' names as well as Llambias' on talkSPORT, added: "I'm a bit surprised. "There's a certain section, exactly the same when I got there. I got over 10,000 letters when I had my heart attack, I felt very proud of that and thought I did an excellent job. "A lot of Geordies are influenced by the media set, because I stood up to 100 journalists that night. It was the same night we beat Tottenham 2-1, the journalists always had it in, many of the Geordie fans were sucked in." Kinnear went on to defend his record as a manager, adding: "I look at my record and they keep saying to me 'what did I do?'. Where have these people been, on another planet? I've been manager of the year three times, travelled the world as a manager. "This job came up, a responsible job. Already they're jumping on the bandwagon, 'watch out Pards' (United manager Alan Pardew) but that's the snidey press around that area that have a grudge. I expect it, it's water off a duck's a***." Kinnear, who made his name as a manager at Wimbledon as part of the 'Crazy Gang', went on to underline that he does not see his presence as a threat to Pardew. "This is not about some of the crap about me coming in and taking over. It's nonsense. I read an article saying 'watch over your shoulder Pards'. What a load of crap and they're feeding it to the Geordie fans. I hope they're not daft enough to believe it." Mark Jensen, the editor of www.themag.co.uk, is worried for Pardew, though. He said: "A lot of people are assuming because of the Kinnear thing yesterday that Alan Pardew is now in the position that Chris Hughton was in the summer before he was removed, that they (Newcastle) have decided they don't want him anymore and will look for the first opportunity to get rid of him. "The one thing you can say about Newcastle, as always, is things are never boring in terms of things to write or talk about. "Unfortunately, it's a massive negative story and most fans think it makes the club look like a laughing stock again." I listened to the interview live, and it must have felt like a road crash for any Skunks fans listening..The man seems to have several screws loose..
Alan Pardew is ready to tell his Newcastle paymasters and the club's new director of football, Joe Kinnear, that he remains in sole control of the first team. Kinnear has claimed he will have authority over the style of play when he takes on the role he dramatically announced he was set for on Sunday afternoon. That, however, could now be a serious area of conflict with Pardew unwilling to allow his authority in first-team matters to be challenged. Newcastle United had still not confirmed Kinnear's appointment last night, a further sign of their surprise that he went public on Sunday to announce his new position and then explain his role at St James' Park. Pardew had been made aware of the impending appointment beforehand but has still to speak with the new director of football. That is one reason why there has been a delay in official confirmation of Kinnear's arrival. It had been planned for yesterday afternoon, 24 hours after Kinnear revealed the news himself. Pardew is willing to meet Kinnear to discuss his role and what impact it will have on the manager's own position, which has been cast into doubt as a result of the impending appointment. Pardew did not have the final say over transfers before Kinnear was set to be introduced to a new role at the club. That was the responsibility of the chief scout, Graham Carr, although it was an area of frustration, with Pardew admitting at the end of the season that the club should have bought more players with Premier League experience. The possibility, however, of an attempt to dictate the style of play, Pardew will not accept. He has contractual responsibility for the first team at Newcastle and it is an area he will not allow Kinnear to control. "In Alan's contract he is the manager of the Newcastle first team," said a source. "His responsibility is the first team." Kinnear, who had a new office assigned to him at the club yesterday, has already admitted his wide range of responsibility will extend beyond playing a part in recruitment. Carr, despite being the first employee at the club to be rewarded with an eight-year deal by owner Mike Ashley, has not had the power to tell Pardew who to sell, something Kinnear said he will have. "If I see players at the club right now and don't think they are good enough I intend to move them on," he said. "I know I've got more knowledge than anyone at Newcastle as a football manager." Kinnear revealed yesterday in an interview with the Newcastle Evening Chronicle that he would now be the man at the club who reports directly to Ashley, who has owned United since buying them from Sir John Hall in 2007 for around £55m. "I'm in a role where I'm the only one who is going to report to Mike Ashley," Kinnear said. "Derek [Llambias, the managing director] is a businessman and he will deal with the finances. That is his expertise as he has run casinos. I will look at things from a football point of view. "We will need to look at where we need to strengthen and look at players X, Y and Z to see who is the best option. I will have an office at the training ground and that is where I will be. "To go from fifth to 16th is a drastic slide. I will be here to put my finger on the pulse and see where we are going wrong. If we see things that we believe are not Newcastle, and not good enough for Newcastle, then I will shift them. It is as simple as that." Kinnear also claimed Llambias had already told him about Pardew's reaction to his appointment. "Derek told me he's had a long talk with Alan, and explained that I'm coming in as director of football." Just listened to the YouTube..
Newcastle United managing director Derek Llambias has left the club. Llambias has made the decision after five years at St James' Park, acting as owner Mike Ashley's right-hand man. Llambias arrived in 2008, taking over from Chris Mort, but he has now decided that the time is right to leave. "I have had an incredible journey during my five years at the club, including some challenging times," said Llambias. "I will reflect with great fondness on my time in the North East and, in me, Newcastle United have a lifelong supporter. "I want to thank the staff for their hard work, our fans for their support of the club, and wish them all well for the future." Llambias's decision comes just days after Joe Kinnear was appointed as the club's new director of football. .. and their first game is away to Man City ..
All fun under the big top. NUFC Imploding again, Lets hope so, Cant wait for Saturday, to meet up with the lads I have a drink with, all Mags, got plenty of ammo for once. going to enjoy my day out. Ian MacNicol/Getty ImagesPaolo Di Canio hopes to have another sideline celebration on Newcastle's home turf, except this time in the cold of February. For many Sunderland supporters, and probably as many Newcastle ones, the most important dates of any new season are those on which their clubs play each other. People talk about the ferocity of the Celtic-Rangers derby, not a phenomenon that can be seen in league form before the 2014-2015 season after the Glaswegian blue half's humiliating two-division demotion. There is a political/religious aspect that may be irrational but, beyond proper doubt, propels Old Firm encounters to heights of passion unrivalled in Britain. But you can safely forget about the Merseyside, Manchester, North London, Birmingham, Sheffield, South Wales and other derbies when looking for the obvious runner-up. The Wear-Tyne and Tyne-Wear fixtures often matter little to the wider world of football. In Britain, and in particular the North-eastern corner of England, they assume an intensity and level of partisan fervour rising above any outside Glasgow. Yet poisonous hatred lurks, too, and I am sorry to say it affects certain people of my acquaintance, among them highly educated folk who have made successes of their lives and in all other respects appear models of good humour and humanity. In most cases, they are no worse than the diplomat's daughter and moderately well-known musician, both Arsenal supporters, who have described Spurs to me as "scum". It is an unpleasant word, but just a word. Ellis Short, the Sunderland owner, has been photographed wearing a pin badge with the letters FTM, which can mean Follow the Mackems rather than F*** the Mags, but usually doesn't. I still see no cause for raised eyebrows and have criticised shrill media responses. At the extreme end of the spectrum, way beyond expressions of hostility that stop well short of criminality, come the two little opposing armies of hard-of-thinking riffraff for whom the occasion presents an excuse for violence or vandalism. So the day for all Tyneside police horses to take to their stables and avoid contact with the human race is February 1 2014. Subject to change, inevitable given the present slot of 3pm on a Saturday, that is the date of the coming season's St James' Park version of the big North East derby. The first game will already have taken place at the Stadium of Light, again allowing for the certainty of change forced by television and policing needs, on or about October 26. If offered a repeat of the 2012-2013 season, a draw in one game and a crushing victory in the second, I would accept the four points with open arms. But unlike those fans who can imagine no matches that are more important, I sometimes suspect a few would even accept relegation if the quid pro quo were six emphatically won points in the derbies. I tend to look elsewhere whenever the fixtures list is published. And I am pleased to see that my confreres at the Sunderland Echo agree with me, headlining their report: "Sunderland start against Fulham and have Swansea swan song." The first is of great significance because it looks winnable and a winning start is always a powerful source of encouragement and hope. The last is all too often, for the wrong reason, more important still. I hesitate to count how many last games in a Sunderland season have arrived with something at stake. That something, of course, is relegation or promotion or, when promotion is already won, the championship of that division. If I remind you that in my time as a Sunderland supporter I have experienced nine promotions, you will quickly work out that there must also have been roughly as many relegations. May or, occasionally, April has been both cruel and kind in this respect. We can disregard the clear-cut seasons -- romps to the Championship title in 1999 and 2005, the demoralising 15 and 19-point Premier bottom places in 2003 and 2006 -- and think back to last days that have brought instant heartbreak or ecstasy. The first witnessed through my own eyes was, disconcertingly, half a century ago, when a late corner struck Tommy Harmer in a place players generally try to avoid being struck and went into the net to give Chelsea a 1-0 win at Roker Park. That was Sunderland's season over; slender hope that Chelsea's remaining game, at home to Portsmouth a few days later, might produce an upset lasted all of two minutes, the time it took Tommy Docherty's team to score the first of seven goals. Seventeen years later, I was in luck when Sunderland's own final game was delayed by two days, until May 12, by the small matter of the opponents having to play the FA Cup Final on May 10. Trevor Brooking, then plain Mr, had scored the only goal in a remarkable Wembley win for the Hammers over Arsenal. I had to drive up from Bristol for the Monday night decider, hoping West Ham would be far too hungover to be able to compete. But supporting Sunderland prepares brightest of optimists for disappointment. I promised my football-loathing wife dinner in a highly rated Indian restaurant if Sunderland got the win or draw they needed, but persuaded her we should have egg and chips at the Wimpy Bar beforehand just in case. West Ham started as if intent on winning, with Brooking in superb form and David Cross twice missing great chances, but Sunderland recovered to secure second place with goals from Kevin Arnott and Stan Cummins. "Why do they have to jump up and down so much," my wife complained as she was buffeted amid pandemonium in the packed Clock Stand paddock when little Stan beat three defenders to score the second. I no longer recall the effect of the earlier snack on her enjoyment of chicken Madras. With memories of such last days in mind, and not straying off topic to reflect on seasons prolonged by playoff deciders, I looked before anything else today at May 11 2014. As that Sunderland Echo headline reported, it is Swansea City at home -- as winnable as the Fulham opener, for all the plaudits (and the Capital One league cup trophy ) rightly earned by Michael Laudrup and his team. But, again, remembering this Sunderland, it is losable, too. 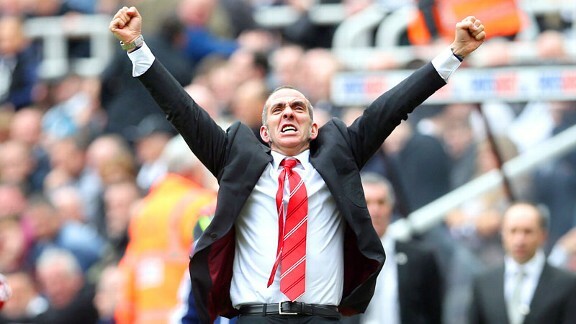 We can have no idea how the Paolo Di Canio reign will have developed by then. As consolation for supporting a team that has not won serious honours for 40 years, Sunderland supporters are often reminded that life is rarely boring, especially at the climax of the season. After the horrors of sharp and unexpected decline under Martin O'Neill, until PDC arrived late to secure the two wins out of seven that preserved Premier League status, I would settle now for a humdrum finish, maybe high mid-table -- with a winning finale against Swansea merely confirming upward progress. I would settle for it all the more readily having also glanced at the homes games that follow the Fulham opener: Arsenal, Liverpool, Manchester United, Newcastle United, Manchester City, Chelsea and Tottenham -- and the last three away games at Spurs, Chelsea and Manchester United. Sunderland may be in need of a cracking away record or a fabulous mid-season. Graham Carr's future at Newcastle United is in doubt after another day of drama at the trouble-torn club. Carr, the influential chief scout who was given an unprecedented eight-year contract this time last year, is considering following managing director Derek Llambias out of the exit at St James' Park. Llambias announced his resignation at nine o'clock this morning following the appointment of former manager Joe Kinnear as the club's new director of football. "I have had an incredible journey during my five years at the club, including some challenging times," he said. "I will reflect with great fondness on my time in the North-east. I want to thank the staff for their hard work and our fans for their support of the club." The Newcastle manager, Alan Pardew, has, as The Independent revealed on Tuesday, vowed to fight to hold on to his position. Pardew gave his first public statement since Kinnear's appointment when he said: "I am staying, to take the club up the league." His resolve has hardened since Kinnear's appointment. Pardew's position has been undermined, with the director of football set to be given an office at the club's Benton training ground. The manager was aware that the club were considering creating such a position last summer. At that point it was felt that Carr's influence was such that the chief scout effectively held the role without the title. Kinnear's arrival has, however, been with a remit to troubleshoot as a more powerful figure than either Pardew or Carr and to report directly to owner, Mike Ashley. On Monday, Kinnear raised questions over Newcastle's long-standing interest in Douglas, the Brazilian defender who is available on a free transfer, after his contract ran down at the Dutch side FC Twente. Carr was unhappy at the intervention and is believed to be considering his future. The 68-year-old Geordie had been hailed as an expert talent spotter as he raided Europe, and mainly France, to unearth the kind of cut-price, rising stars Ashley saw as the way forward for Newcastle. Carr helped the club land Cheick Tioté, Hatem Ben Arfa and Yohan Cabaye for the combined total of just £14m and, when they finished the 2011-12 Premier League season in fifth place, was seen as key to that success. Carr also played a key role in the arrival of Moussa Sissoko and Mapou Yanga-Mbiwa earlier this year. However, Ashley was so furious with what he saw as a failure across the board last season as Newcastle were dragged into a relegation struggle that he has given Kinnear complete control at the club. Ashley has backed more than £40m in transfer spending in the last year. It is unlikely he will sanction more new money being spent and Kinnear has admitted already he has the authority to sell any players he believes are "not Newcastle". Pardew is expected to be in charge for the start of pre-season training. The odds on Kinnear succeeding him had dropped to 3-1, with Gus Poyet second favourite. It looks pretty lethal this time around. They'll either gas us with their garlic or we'll string 'em up with our spaghetti.